Thirty two years have passed. On the 30th anniversary of the break up on the band they reformed meeting for weekends in Weardale, Co. Durham, in the north of England. Caedmon was always a weird mixture of musicians and their musical influences jostling to find some space to work together. With thirty years to establish and cement those disparate styles, what did this bizarre mixture bring to the table? 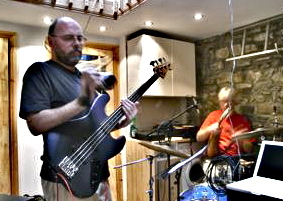 Jim doesn’t use a fuzz box to try and rock out quietly, Ken plays everything including the cello, Simon has dropped the bongos for a full drum kit, Sam now plays a gut throbbing five string bass, and Angela… well Angela, initially reluctant, has been persuaded to get behind a mic again. Now she’s a working vet, and possibly the only member of that student band that actually does what she trained for at university. So how has the music changed in those thirty years? The evidence of their toil is now available on Amazon, iTunes, and eBay in a smart digipak-ed limited edition CD or as download. Initial reviews find a connection between the old and new in their music. Also, thankfully, there’s a sense that Caedmon’s music has progressed expressing maturity, variety and novelty. Enjoyed looking at your web site and congratulations on living another 30 years, despite the heavy drinking of communion wine which I witnessed with dismay. I see Flash is still giving out instructions to drummers…. guitarists are Gods ! Hi there thought I’d left a message yesterday but it obviously didn’t go through. Just wanted to say Hi to Angela – I worked with her at a vets in Halifax way back then. I have your record – its been to Canada and was one of the few treasures I brought back with me. Nice to see this site – can’t stop singing Ten Maidens Fair now!! Sounds as fresh as yesterday but how did you cope without lighting ? Just popped upstairs to look for my original recording, looked everywhere, nothing but John Prine,Kursall flyers, Red box and the Alpha band ! Hey So great to see you. I am a fan of Derek Webb see his album Mocking Bird…the best.. ( love the line in “New law” “Just give me a shot of grapejuice” fake wine in one of those plastic communion cups….. ooops sorry…. and was chatting to him 6 days ago about you as his old band was Caedmon’s call. Funny how you popped up today through the facebook network will listen for you. Very nice sounds – eat your heart out Steeleye Span ! Thanks, Gerry. Going well if a little slowly. You can follow progress (if you really want to) on the Weblog tab above. Good luck on Friday and Saturday. I hope to be there on the 8th. By the way, I see you have a comment by Jim Fotheringham on 10th June 2008. Not only is that my father’s name, it’s also his birthday — 89 this year and still a fan of Artie Shaw and Benny Goodman. I may be able to convert him to Caedmon after this weekend. John, I didn’t realise the drummer with Miracle Road, Ever After, Hip Operation etc was your dad. He’s very well preserved for 89. Thank you all so much for a wonderful evening of fun and reminiscences. You don’t remember us but you made a huge mark (a good one!) on our families lives. Our oldest daughter was 40 last year and we made her a DVD of her life and part of it was her singing with Caedmon in our sitting room. Thanks for the happy memories. God bless and lang may yer lums reek! Hi Moira, I’m straining my defective memory remembering Halifax. Did we got to The Hiding Place film together? Lovely to hear from you. Our concerts went well last weekend, hope to have cd ready in next millenium. Angela. WOW Ellen, How could I possibly forget my big buddy from the States. I would love to be back in touch + hear your news, I think I kept all your letters!! The Caedmon reunion was…don’t know which words can describe it. Really enjoyed the concerts + meeting many old friends, looking out on a sea of middle aged faces + every so often thinking ‘that’s so and so’. Would be good to email occasionally. Do keep in touch. Hugs Angela. – not only chickens need hugs. Simon may remember me, I was the lighting man for ‘Fairly Solid’ all those years back, lit the band at least once as well. Just found out Caedmon are back together, love the new album – have to look out the old one, haven’t played it for a while for fear of damage. Over two years ago I went to look for my original recording and I could not find it. I remember it well, everyone in the band signed the sleeve and Ken’s comment “he came, he saw, he lit” was still wet when Jim smeared it with his forearm while signing his name……… shame so many memories but no record. Tonight I went to look for some old photographs in the loft and guess what I found? No not my original signed copy but an unplayed recording in it’s sleeve, of course I bought two copies and kept one to play to the grandchildren! Does anyone want to buy a pristine copy of a collectors item? Must be a feature of this model. I got Jerry Donahue to sign a Fotheringay CD last year and then smeared the wet ink putting it in my bag.